Whoa. Is August REALLY nearly over? For sure? Well GOOD. Maybe this heat will go away with it. :) Meanwhile, head on over to Joyce's for some HodgePodge. 1. Americans will celebrate Labor Day this coming weekend. Do you know what we're actually celebrating? (without consulting your friends Google or wikipedia, ahem) What's a project you're currently 'laboring' over? Ok, well I did consult Google because I wanted to see if I was right about it being a holiday related to the economy and business and all that. I was sort of right. I think. Anyway, I'm still laboring over the painting in the main area of the house. I decided to paint the bookcases the same color as the walls. It was a great idea because they look really good. However, (isn't there always a HOWEVER when it comes to home improvement?) the freshly painted bookcases made the walls look dingy. So now I have to paint the walls. AND I've decided to paint the fireplace bricks... One thing certainly does lead to another. And another. And another... Sheesh. 2. Labor Day also signals the unofficial end of summer for most of us...what summer food will you miss the most? If you're in the southern hemisphere feel free to substitute winter for summer.It's hard for me to miss anything about summer. Summer foods are usually available around here year 'round but not watermelon so, I pick WATERMELON! 3. A well known proverb states, 'It's easier to seek forgiveness than ask permission.' Your thoughts?I hate this. And I have no respect for people who put it into practice. I feel that it is a very juvenile way to think and behave. It's just another way for some people to justify bad behavior and get their way. 4. Food critic, film critic, book critic, art critic....which hat would you most like to wear? It's a toss up between film and book critic. While I love to eat food, I don't have a palate that would interest anyone and I can't discern one flavor from another in a dish. I don't know enough about art to be a critic. All I know is whether or not I like something. I know nothing about the colors or lines or whatever doing this and that. But I can do some talking about films and books and sound like I know what I'm talking about! We should start our own little online book club girls! 5. When you were a kid, who (besides your parents) was your favorite adult? My grandparents and my Aunt Betty. Without a doubt. 6. The astronaut, Neil Armstrong, passed away last week. He was regarded as a hero by many generations of people all around the world. Do we still have modern day heroes? What makes someone a hero? My heroes are not in the news. They've never been to the moon or saved a life or leaped a tall building in a single bound. My heroes do things that seem so simple to most. But, to me, they are great feats. Like when the husband doesn't laugh at me or scoff but takes care of a leaky faucet or keeps my car gassed up or takes the garbage out every day because I get freaked out in the side yard because I thought I saw a snake out there one day a long time ago. Or when my brother just seems to know that I need a laugh and texts me one of his corny jokes or just one that says, "I love you! Have a great day!" Or my dad when he calls just to chat and listens without passing judgement or comes for a visit and is the life of our gatherings. Or when my SIL stands for hours making all those lumpia just because the lovelies love them so much. Or when Deanie comes home and slips into the kitchen before me and cleans up the mess from a big family meal. All those heroes who make the news do really nice things but my heroes are those people who do little, seemingly insignificant, things that mean so much to someone. 7. I never get tired of learning. 8. Insert your own random thought here. 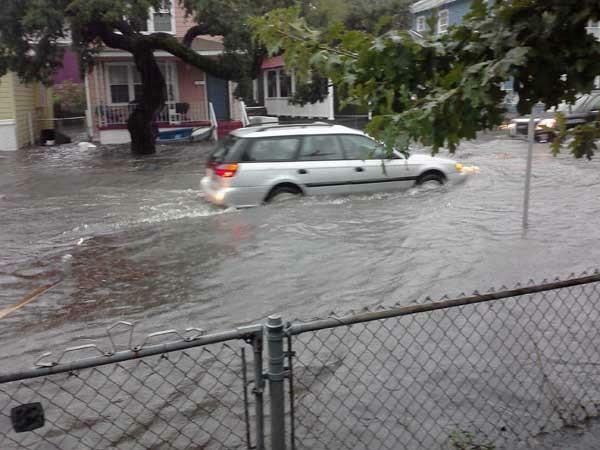 Here are a few pictures from our local CBS station of downtown Charleston yesterday. Thanks to Isaac. We had some rain---and some flooding. But this is NOT unusual when we have heavy rain. The rain doesn't even have to be heavy during high tide for this to happen. College of Charleston student. DoodleBug goes to school here. Luckily, she doesn't have Tuesday classes! Though she and Birdie have both biked through water like this on several ocassions. Hope y'all have a great Wednesday! I'm stalling. I really should be changing a poopy diaper, but it can wait til I respond to this post. lol I loved your paragraph on heroes. Also, I'd really like to visit your neck of the woods some day - preferably not in the summer! Love the photos of all the rain and people riding bikes in this rain. I also LOVE your answer to a hero. You're right,they do things to make life easier and it's not part of their job! They just are the kind of person that does that. Great answer. I love the pictures!! Well it looks like here when we get enough rain to do that. paddling in the store though that is new. I liked very much what you said about heroes. That is so true. Have a great Wednesday. LOVE your answer to Nr. 6. Those are my feelings as well. In that sense my hubby is a TRUE hero too! Thanks for posting the pics. Gives me a little insight of what´s happening over there. Loved your answers about heroes! Betty- Thanks! It's a nice feeling when we can see our spouses as heroes, isn't it? Not much happening here- we're on the Atlantic coast. But lots happening in the Gulf! Sadly the idiots of this world quite often need rescuing and end up putting others at risk too. I am with you on the home improvement projects escalating, especially when paint is involved. A wall caan look perfectly fine until you paint a wall that butts against it. Then you wonder why you never noticed how dingy the original was! LynnMarie- How did I miss your comment?! I'm so sorry! The college kids just get out there and have fun in it- they did finally cancel classes yesterday, but not until 5:00. Which was after the rain had stopped. Oh well. Maybe high tide at 6:00 factored in their decision. Lucy- Nothing would ever get done here if we didn't do it...I mean, if I didn't do it. LOL For financial reasons and the fact that the husband just never gets to it. It can be dangerous just washing a wall...the job never ends after that. 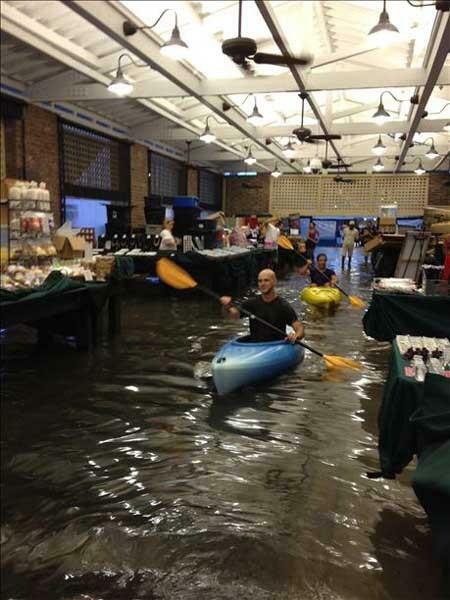 Kayaking to market. If it didn't mean flooding, it would be fun. 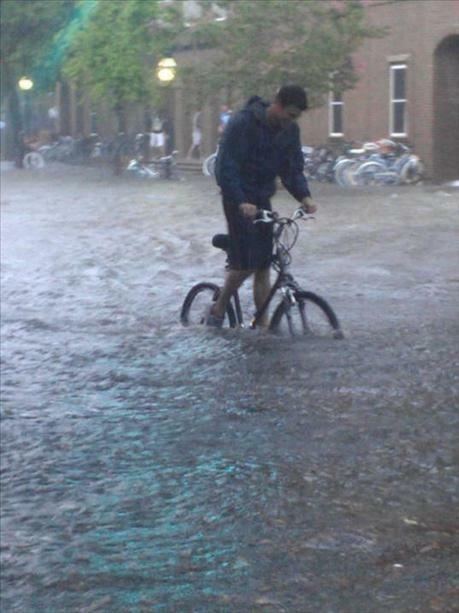 I can't imagine riding a bike through that much water. Stephanie- Very true. They're really used to it downtown. We get flooding when we get even a slight rain if it coincides with a high tide and full moon. Wow! I didn't realize Isaac had been that far reaching. We got some local flooding but we're very thankful it was not severe. Great testimony on who real heroes are. Nice post! Oh my, those pictures break my heart. Are you okay at your house? #3 It's easier to ask grandma. wow I didn't realize South Carolina had flooding. I thought it was only the gulf coast. Wow, I knew that there was some flooding when there is rain during high tide, but I didn't realize that it was this bad. We're going to get a whole lot of rain from Isaac, too ... Friday through Sunday ... 6-12". Hopefully it will fall slowly enough to actually do some good ... the ground is so dry and so hard that if it rains hard, it'll just run right off instead of soaking in. Arlene- I know. Those outer bands can go a really long way out. Thanks! Debby- We are fine. We just got outer bands and they dumped a bunch of rain. 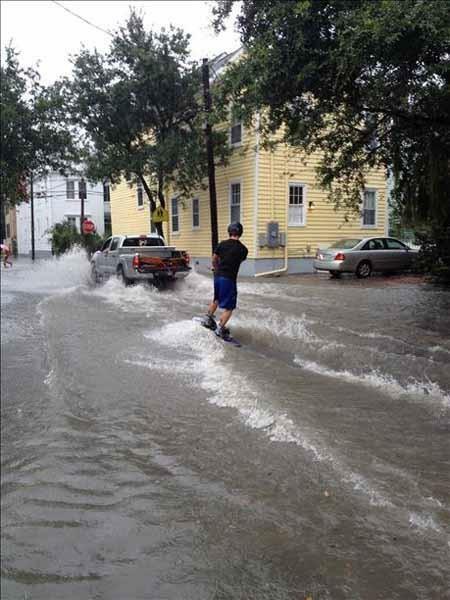 It floods downtown Charleston all the time, so nothing really new there. Thanks for asking! bill- It was always easy to ask my grandmother, that's for darn sure! LOL Yep, we got the outer bands. The bands can go quite far out. Kathy- I hope the rain y'all got helped instead of caused problems!